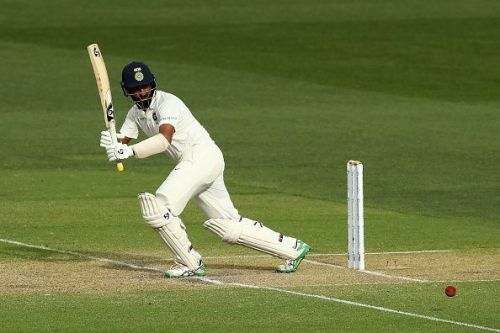 The third day of the first Test between Australia and India entailed its fair share of action. Despite losing time due to bad weather, the day still served up some fascinating contests and narratives moving forward. Australia started the day at 191-7 with Starc and Head at the crease. Bumrah got rid of Starc before rain played spoilsport. After the first rain delay, Head and Lyon stitched a 31 run partnership. However, Shami sent Head and Hazlewood packing off consecutive deliveries to ensure India claimed a 15 run lead. India started the innings in a much more controlled manner than on Day 1. The openers combined for a half-century stand before Starc got the better of Vijay. Rahul was the next to follow as he fell to Hazlewood. However, India’s most accomplished batting pair of Kohli and Pujara ensured that India didn’t let their advantage slip. At 147-2, all signs pointed to India finishing the day strongly. Yet, there was one final twist in the tale. In the final half an hour of the day’s play, a Lyon delivery caught the inside edge of the Indian skipper’s bat and the ball nestled safely in Finch’s hand. With the dismissal, India could just have left the door a little ajar for Australia to mount a comeback. There is considerable intrigue surrounding how the next couple of days would pan out at the Adelaide Oval. Thus, making this a perfect advert for the longest form of the game. Adelaide has been one of the traditionally spin-friendly venues in Australia. However, since the era of ‘drop-in’ pitches took over, the pitch has generally not been as conducive to spin as earlier. Yet, the current pitch on offer has supported spin more than either team would’ve envisaged. On Day 2, Ashwin spun a web around Australia’s left-handers and ended with three scalps to his name. With Ashwin, an away spinner performing so adroitly, all eyes were on Lyon to neutralise the former’s impact with his own brand of off-spin. Lyon toiled throughout India’s innings yet only had the wicket of Kohli to show for his efforts. Though the dismissal might still end up playing a defining role in the Test, Lyon was expected to do so much more. The off-spinner got the ball to spin and bounce consistently. However, it seemed that the Indians had devised a perfect plan to tackle him. Vijay employed the sweep, Rahul the reverse-sweep, Pujara used his feet whereas Kohli used his trademark lunge forward. Despite Kohli eventually falling to a lunge, the aforementioned batsmen had done enough to make Lyon deviate from his line and length. The Australian off-spinner likes to bowl outside the off stump, drawing the batsmen forward and finishing his deliveries on off-stump. Yet, the Indian batsmen’s plans meant that he bowled much straighter than he would’ve liked. A majority of Lyon’s deliveries finished on the middle and leg stump, thus posing lesser problems for the Indian batsmen. On recent away tours, the Indians have inexplicably fallen to spin in the latter part of Test matches. Moeen Ali did it in Southampton this year, while Lyon did it in 2014 at the Adelaide Oval. However, the Indian batsmen’s clear mindset and uncluttered thinking helped them gain the edge over Lyon at Adelaide this time around. 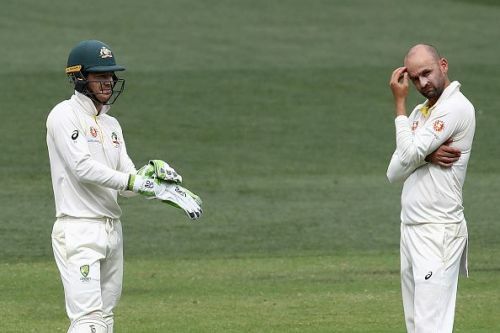 With substantial turn on offer, the Aussies will surely hope for Lyon to turn the match in their favour. Yet, on evidence, it seems that the Indians might have finally found a way to tackle Lyon in South Australia.